Thanks to information about closed ski areas in MA provided by Kevin Thomas, we have confirmed this ski area. Actually, I first saw this one on a Scout camping trip in the mid 1990's. We were camping at Windsor Lake, and I happened to see this former ski area. 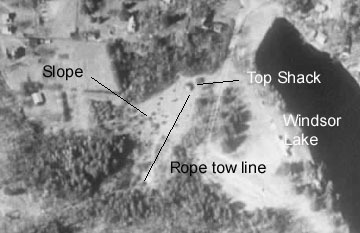 The rope tow was still standing, as was the top shack (another upside down area), although the shack was infested by hornets. The slope was quite grown in. The annotated Terraserver pic appears on the right.